Chakra Can Affect Your Health. Chakra colors have always held such a fascination that I wanted to include a section to help you to understand a little bit about how the chakras work as an interface between your the emotions your body and how utimately in times of stress or disturbance, your physical health will be affected. The last few days have been spent with coloured pencils trying to sketch out what I wanted to show you, and frankly the effort was pretty poor! Then I discovered that there are whole wealth of much more talented artists than I who have made their work available for me to use. Here's hoping you enjoy admiring their work as much as I have and I have included the url of a fabulous chakra colour chart(chakra color if you are from the US...sorry we Brits spell everything strangley don't we?! )at the end of the page. I love this particular chakra colour chart because not only does it show the chakra colors and their locations but the depiction has such vivid sense of vitality. I want to start by making what is probably a slightly inane observation about the pictures. 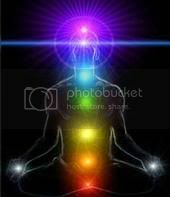 It seems that all the artists are obsessed with portraying chakras in meditation but of course the pictures could just as likely show the chakra colors in any other situation. I suppose that the crown chakra may not look so divine if it were part of an illustartion of something as mundane as putting the rubbish out. Without doubt the chakra colors increase in vibracy and intensity when charged through meditation, but to be clear the chakras are always part of us. 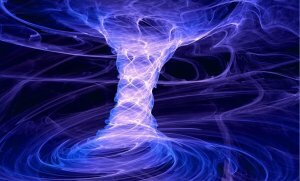 The easiest way to describe them are vortices of energy that run all the way through the body and right the way through all of the etheric bodies (you may also know this as the aura). They are made up of many, many fibres or strands but in other cultures these are also seems as petals. Now this is a good representation of what a chakra would look like. Imagine the chakra spinning right the way through you, and reaching out into the universe, protuding through the front and the back of the body. 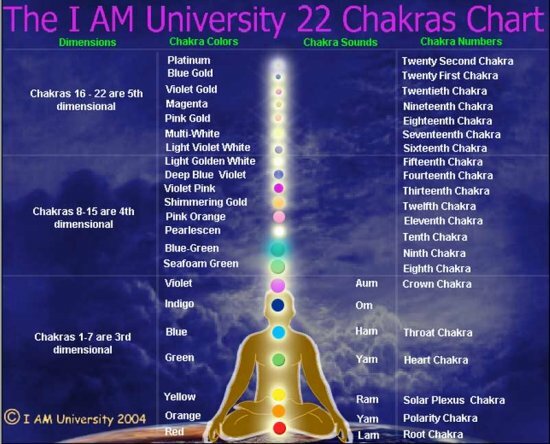 Now imagine that there are seven of these of these chakras spinning through the body all different colours. Our health depends on each of these chakras spinning open and closed reglarly and methodically. This opening and closing in a clockwise direction not only vitalises the etheric bodies but also in turn our physical bodies. You see, the chakra location is also important as each chakra governs its own certain part of the body. Chakra colours become depleted as the energy ceases to flow so effectively as it did. As the colors fade or become murky the vibrations start to drop and work on a much lower resonance. The vibrancy of the chakra colours determines the vitality of the energy that is supplied to the organs. Remember that the chakras are barometers of the emotions but are also a quintessential interface between the emotions and the physical body. Raw and harsh emotions jar the chakras, the energy is disturbed. Negative energy is retained polluting the chakra colors and sending toxicity through the organs. 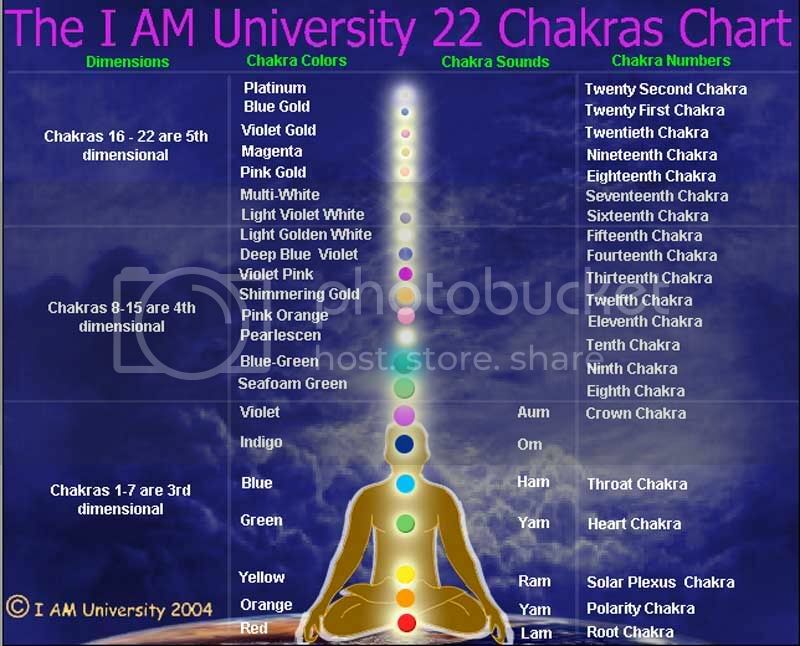 So lets delineate each of the chakra colors in turn starting at the Purple chakra or crown chakra (which is actually violet) which in effect I suppose is backwards because it is the seventh chakra. As promised here is a chakra color chart which delineates not only the 7 major chakras but also the 15 other minor ones that help channel the energy too. Click on the picture and it will take you to a much larger version for you to download if you wanted to. Invesica.com have lovely chakras chart which has other correspondinginfomation such as which angel each chakra is associate with. This is a lovely fun page on chakras which I am sure you will find really entertaining and useful.